Types of solvent. The slight positive charge on the hydrogen atoms and slight negative charge on the oxygen atoms of water make it particularly suitable for dissolving inorganic salts. 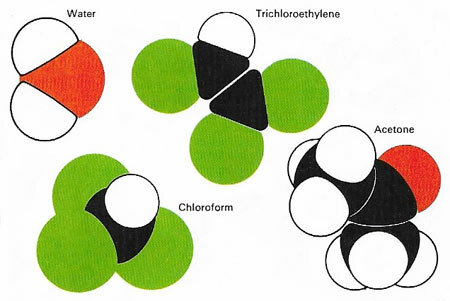 Trichloroethylene, widely used in dry cleaning, and chloroform both dissolve many organic compounds. Acetone, with behavior intermediate between water and trichloroethylene, is able to dissolve both organic and inorganic compounds. A solvent is a medium in which a solute is dissolved to form a solution. Generally "like dissolves like"; thus a nonpolar covalent solid, such as naphthalene, dissolves well in hydrocarbon solvent. Overall, the best solvents are those with polar molecules and high dielectric constant: water is the most effective known. In terrestrial living systems, water is also the solvent of overwhelming biological importance. It provides a fluid in which molecules of nutrients and waste products can be dissolved and transported, helps regulate the temperature and preserve chemical equilibrium within living cells, and makes up a major fraction of the body weight of every organism on Earth. A polar solvent is a compound, such as water or liquid ammonia, that is composed of polar molecules. Polar solvents can dissolve ionic compounds or covalent compounds that ionize. Nonpolar solvents, such as benzene, will only dissolve nonpolar covalent compounds. For more than a century, there has been speculation about whether life on other worlds might use substances other than water to fill the same role. Many different solvents are known, including hydrogen sulfide (H2S), the closest chemical analogue of water, and hydrogen chloride (HCl). But two major problems affect the majority of these potential rivals. First, they contain elements, such as sulfur and chlorine, which are much rarer than the main biological elements of carbon, hydrogen, oxygen, and nitrogen. Second, they break up into their constituent atoms more easily. Having said this, at least two possible candidates for alternative biological solvents can be identified: ammonia (NH3) and methanol (CH3OH). To be effective in sustaining life, a solvent must remain liquid over a wide temperature range, so that inevitable variations in the conditions on a planet or moon do not cause the solvent to freeze or boil. This range should include those temperatures that allow the chemical processes of metabolism to take place at an optimum rate without disrupting ("denaturing") essential organic molecules. The solvent should also be able to cushion the organism against changes in external temperature by having a high heat capacity and high heat of vaporization. Finally, it must be able to dissolve a great variety of chemical compounds, including nutrients and waste materials, so that these can be transported internally within an organism. Both ammonia and methanol remain liquid at temperatures well below the freezing point of water. This might appear to be an advantage on a world that was generally much colder than the Earth. However, it is not clear how metabolic processes could take place quickly enough to sustain life at very low temperatures. Ammonia has much the narrower range of the two and will only remain liquid at temperatures below minus 33°C. Methanol, by contrast, is liquid over all of the normal temperature range experienced by terrestrial life, with the exception of some hyperthermophiles. Regarding heat capacity, ammonia has the advantage over both water and methanol. Yet a solvent's ability to act as a thermal buffer, and thereby regulate the internal temperature of an organism, depends also upon the heat of vaporization. In this respect, water is far superior to its two rivals. Water's high heat of vaporization means that only a small amount of evaporation from an organism is needed to carry away the heat released by cells as a result of their metabolic processes. Temperature regulation is especially important to the highest forms of terrestrial life, notably mammals and birds which are homeotherms, and has been crucial to the rise of intelligent, large-brained animals such as ourselves (intelligence, nature of). Another property of biological significance is surface tension, a measure of the ability of a liquid to form droplets. Water has a very high surface tension, a fact which was probably crucial in the formation of aggregates of organic compounds before cells evolved. It would have forced some chemicals together while, at the same time, preserving boundaries between mixtures of different molecules. In living organisms today it continues to play an important role in concentrating solutions of substances at the boundaries of different media in an organism; for example, at a cell membrane. Of all the features of a solvent, however, the most biologically important is that which defines it — its ability to dissolve other chemicals. In this respect, water is superior to both ammonia and methanol by about a factor of two.